$0.75 Milk Coupon Reset Again! Wow! 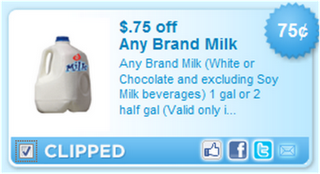 The $0.75 off any brand milk coupon has reset again on Coupons.com! You can print it twice per computer. This coupon is only for Utah and Idaho residents. It also looks like the $1.00 off any brand cheese coupon has also reset! Make sure to pass along this info to family and friends. Every little bit helps to cut the grocery bill.